was written for my friend, poet Rane Arroyo, who had a serious liver condition, during the time in which he was trying to get a approved for a liver transplant. He died sudden;y in 2010. Someone is trying to decide whether my friend should continue to exist, whether a queer brown man who is a poet deserves to be put on the list next to the Primrose Violet, the Red Cockaded Woodpecker and the Little Blue Heron. I tell them the threat of extinction is specific. It is the Yellow Headed Blackbird, and not the Red Winged that is endangered, that the Maidenhair fern hangs by the thousands in plastic pots in home and garden stores, but the Southern Grape Fern doesn’t have much time. Don’t think, I say to them, that one thing replaces another. Each precious endangered creature is itself and no one else. The wet mammalian grace of the dugong is not the same as the grace of the humpback whale, which is also a mammal that rises dripping out of the seas. You can’t say we already saved a sea mammal, a fern, a blackbird. I tell them the right to live is indivisible. You can’t prorate it. It isn’t a dividend on investments. There are no actuarial tables to determine how worthwhile each unpredictable life will be, how much mileage the world will get from one good liver in this one ailing poet. 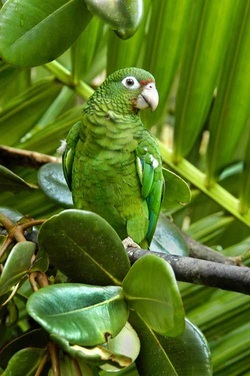 Look, I say, there are still six breeding pairs of Puerto Rican parrots living their rare, defended lives deep in a forest invaded by grabby, fugitive parakeets. Maybe they are the last generation. Maybe they will soon vanish forever from the world. We shelter them for the possibility that great clouds of green wings will once again rise over El Yunque, but also because this afternoon of sun flashing through rain among the palm fruits, and this one man, making tropical poems in the middle of snowy nights, raising warm seas between the stalks of corn, are reason enough.